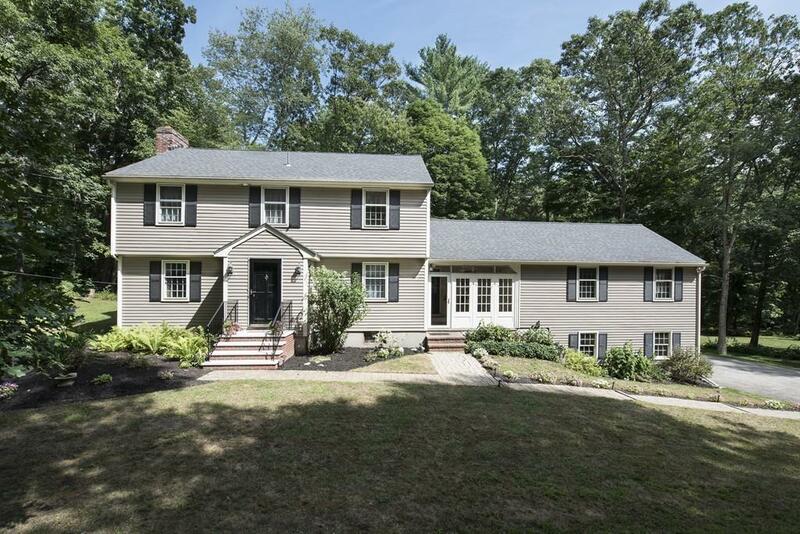 Effortless entertaining in this warm and inviting Colonial! The heart of the home is a bright, sun-filled HUGE eat-in kitchen with a soaring vaulted ceiling, skylights, SS appliances, granite counters and center island. Kitchen is open to a large family room and has French doors leading to a spacious deck overlooking the private backyard. The first floor continues with a formal living room with fireplace and crown molding, dining room, half bath, convenient laundry area and mud room. Second floor offers a master bedroom with ensuite bath, 3 additional bedrooms with ample closet space, and a newly remodeled full bathroom. Possible expansion of living space with the walk-out heated basement. Located in the sought-after Masconomet school system, this home is in a great commuting location with easy access to parks and hiking trails. Listing courtesy of Dennis Marks of Keller Williams Realty. Disclosures Seller To Offer Credit At Closing For Refinishing Of Hardwood Floors - Dining Room And 1st Floor Hallway Photos Re-Touched To Reflect What The Floors May Look Like. Listing provided courtesy of Dennis Marks of Keller Williams Realty.